Despite our focus on influenza each year, it is far from being the only respiratory virus capable of causing severe outbreaks. It is, however, capable of substantial virulence and is highly mutable, making it both an annual visitor and (on rare occasions) a pandemic threat. Other respiratory viruses of concern include human rhinoviruses, human metapneumovirus, RSV, parainfluenza viruses, coronaviruses, and adenoviruses (see A Plethora Of Pathogens, Even During A Pandemic). To give you an idea of how common some of these viruses really are, a little over two years ago Dr. Ian Mackay produced the following graphic on his VDU blog. 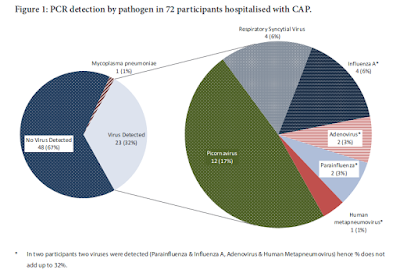 As you can see, adenoviruses were more commonly detected than influenza. 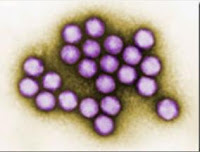 Ubiquitous in humans and animals, hardy survivors outside of a host, and able to circulate year-round, the 52 known serotypes of adenovirus can cause a wide spectrum illness, ranging from asymptomatic carriage, to mild `cold-like' symptoms, up to severe pneumonia. Interestingly, a person can have – and shed – adenovirus for weeks or even months without showing symptoms. The virus was first isolated from the adenoids in 1953, hence its name. While no vaccine is currently available for the public, the military is using a recently approved (March, 2011) oral vaccine against types 4 and 7 on new recruits to help prevent outbreaks. Over the years we’ve followed a few high-profile outbreaks of adenovirus infection, including 2012's China: Hebei Outbreak Identified As Adenovirus 55, and a multi-state outbreak of virulent serotype Ad14 a decade ago (see 2007 MMWR Acute Respiratory Disease Associated with Adenovirus Serotype 14 --- Four States, 2006—2007). All of which serves as prelude to a recently published EID Journal research report on a reemerging human adenovirus called HAdV-B7. Several human adenoviruses (HAdVs) can cause respiratory infections, some severe. HAdV-B7, which can cause severe respiratory disease, has not been recently reported in the United States but is reemerging in Asia. The number of `known’ respiratory viruses increases practically every year, due to advances in microbiology and sequence-independent amplification of viral genomes. There is, no doubt, much more to discover about the myriad of non-influenza respiratory viruses in circulation around the world. Most will prove to be clinically indistinguishable from the respiratory viruses we already know, producing mostly mild `cold-like' symptoms. But as we saw with SARS-CoV in 2003, HEV68 in 2008-10, MERS-CoV in 2012, and EV-D68 in 2014, they can occasionally surprise. 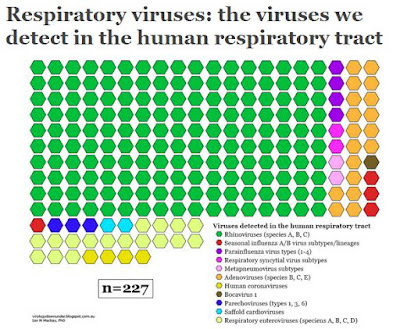 Which makes the surveillance and identification of these respiratory viruses more than just of academic interest.